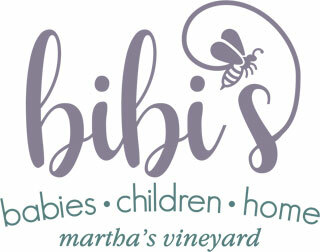 Bibi’s Boutique for Babies, Children and Home is a specialty boutique and online retailer located on the beautiful island of Martha’s Vineyard. Our mission is to create an unparalleled shopping experience, offering you a unique selection of high quality products and services all under one roof. Our vast assortment of children’s fashions include Made in the USA and European designers, hand knits, special occasion, flower girl, communion, and exquisite hand sewn Christening gowns. We have a full service layette department that will provide you with everything you need to welcome your little one home, from take-me-home outfits, designer sleep sacks, beautiful handmade bassinets and moses baskets, to plush blankets. Convenient baby registry services are also available. We carry an incredible selection of linens and bedding for baby up to adult. Everything from baby cribs to king size beds and all sizes in between. A wide array of beautiful fabrics and designs can be customized to fit your style and decor needs. Our furnishings are unique and varied. We offer many bench made and customizable designs. Only the highest quality products and manufacturers are sourced. At Bibi’s, you can find something for every room in the home including cribs, beds, chandeliers, rugs, artwork, upholstered furniture, gifts and other room decor items. Our custom room design services will help you achieve a beautiful environment for your child, yourself and your home. We would love to meet you or hear from you!